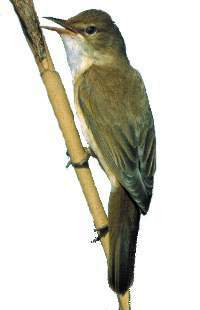 At 5 cm longer than a Reed Warbler the Great Reed Warbler is the largest warbler in Europe. Easily distinguished by it's sheer size and loud raucous song, best described as alternating croaking, whistling and warbling. Preferred habitat is wet reed beds in ditches or by rivers. Rare vagrant to the UK, most likely to appear in May or June. More common breeding bird in Europe, were it is a summer visitor from Africa.